When one strips aside the layers of myth and legend from those dark days over Europe when "strategic" bombing ground Germany's cities into dust, there is no doubt that airpower played a decisive role in the winning or losing of the war. But that decisive role was no greater than the victory in the Atlantic that allowed America to bring its industrial and military power to bear or the victories of the Red Army on the eastern front that slowly but surely wore away the Wehrmacht's fighting edge. Although the air war was only a part of an enormous conflict that swept over Europe, it did prove decisive in helping the Allies achieve victory since it played an indispensable role, without which the Anglo-American lodgment on the continent and the final defeat of the Third Reich is inconceivable. the spring of 1944 were largely indirect, even though the destruction of population centers was obvious and extensive, and the damage to industrial production in the spillover of "area" bombing attacks at times important. Yet, the night bombing campaign's greatest contribution to the winning of the war was precisely what Harris claimed and what the conventional wisdom has so often discounted: The "area" bombing attacks did have a direct and palpable effect on the morale of the German population, and the German leadership, in response to that impact, seriously skewed Germany's strategy. Recent scholarship in the Federal Republic indicates that as early as the summer of 1942, the night bombing campaign was affecting German attitudes.2 In 1943, the heavy bombing caused a dramatic fall off in popular morale. Knowledge of what had happened at Hamburg spread throughout Germany; and in south Germany, the attacks on Nuremburg, Munich, and Augsburg made the population restive, angry, and bitter. The SD (Sicherheitsdienst, Secret Police) reports on what the population was saying (reports widely read in the highest levels of Nazi leadership) noted that people no longer exchanged the Nazi salute, reviled the party as the author of their trouble, regarded Goebbels as an outright liar and cheat, wore party badges less and less, and were depressed and embittered at the course of the war. The population singled out the Luftwaffe particularly for their reproaches, and as early as the "Lancaster" attack on the MAN works in Augsburg in April 1942 wondered why such an important location had not received sufficient protection. Even more alarming to Germany's leaders were comments by women "of the lower classes" that even 1918 was not as bad as this. These SD reports clarify several aspects of Nazi political and strategic behavior in the last years of the war. Initially, the constant repetitive theme in Nazi propaganda that Germany would never suffer another November 1918 reflected real worries, reinforced by the SD reports, in the highest levels of government concerning the impact of bombing on popular support and morale. These reports help explain why the regime was unwilling to embark on a scheme of "total" mobilization of the Reich's economic and human resources until after the July 20, 1944, attempt on Hitler's life. Until that point, reports on popular dissatisfaction and lowered morale due to the bombing made Hitler leery of squeezing the German population as hard as Germany's World War I government had done, and thus running the risk of another popular explosion similar to October and November 1918.
of demands for the V-1 and V-2 retaliation weapons was enormous. The strategic bombing survey estimates that the industrial effort and resources expended for these weapons in the last year and a half of the war alone equalled the production of 24,000 fighter aircraft.3 Here the regime was reacting to popular pressures, and the resulting decisions responded to political factors rather than to strategic and military realities. Thus, just in terms of the retaliatory weapons policy, the distortion that the bombing achieved in the German war effort was of real consequence to the war's outcome. The American daylight bombing campaign reinforced these trends. Throughout the last half of 1943, Göring bitterly reproached his fighter pilots despite their efforts and sacrifices. His comments that the German people could not understand how American bomber formations flew untouched over the Reich shows that the Reichsmarschall was reading the SD reports as well as receiving bitter comments from Hitler and other Nazi leaders. 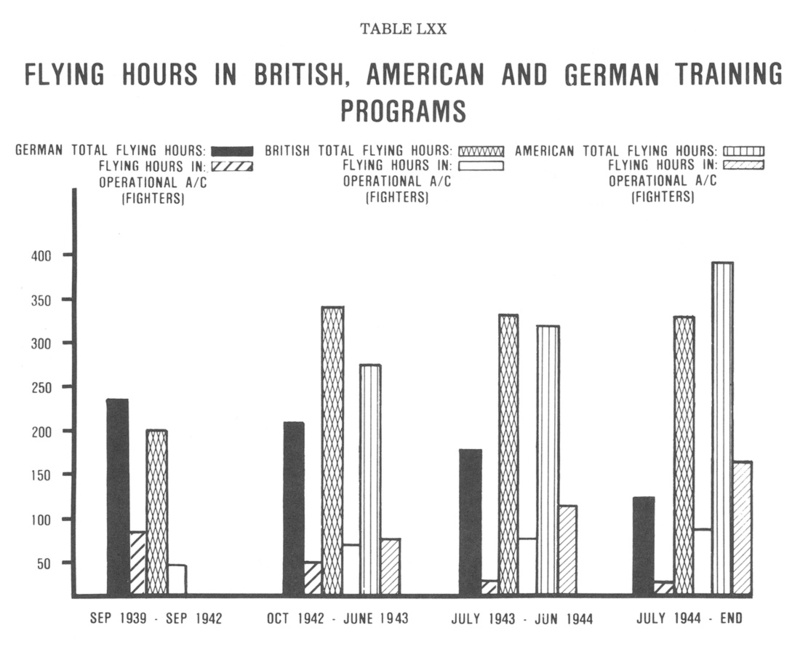 References drawn from popular disquiet over the daylight bombing sprinkled Göring's speeches to his generals as well as pilots.4 But the contribution of the American air forces to the war effort was more direct in 1943 and 1944 than Bomber Command's skewing of Germany's production efforts. From late spring 1943, American "strategic" bombing attacks against German industry imposed a wasting attrition on the Luftwaffe's fighter forces. The severe fighting over the Reich in the summer and fall coupled with decimation of air units fighting on the periphery placed a rising and, in the long run, intolerable burden on the Luftwaffe. Moreover, production of new fighters fell off substantially due to American bombing. Nevertheless, American air commanders were forced to suspend daylight, unescorted bombing missions in October. The respite was short indeed. In February 1944, the American bombing forces returned to the Reich, this time accompanied by fighter support. In the air battles that followed, American air forces broke the back of the Luftwaffe and assured complete Allied air superiority over the continent for the invasion. The achievement of that air superiority allowed the Allies to launch a true "strategic" bombing effort in which the air effort was closely integrated into overall strategy. Bomber Command's specialized marking capabilities and navigational aids allowed it to destroy marshalling yards throughout northern France, while Eighth Air Force and the Allied Tactical Air Force contributed to a creeping transportation paralysis throughout western Europe. German movement was substantially hindered, and the transportation of reserves to the battlefront in Normandy became most difficult. Meanwhile, Eighth's attacks on oil production insured that the immobility of the rail system spread to motorized movement as well. They also ended permanently what small chance the Luftwaffe had for a comeback. Thus, the efforts of the Allied air forces, "strategic" and "tactical," played a critical role in the winning of World War II. Airpower had shown that it worked to greatest effect when its strategy was integrated and was connected with efforts on the ground and at sea; and that while airpower had not changed the rules of the game, it had become a critically important element in the overall equation. One can argue with justification that the Germans lost World War II in the late summer of 1940 and that their future defeats on the ground and in the air sprang from their unwillingness at that time to identify and to face the real strategic situation. In the euphoria of victory over France, the political and military leadership refused to acknowledge that it had won only the first round of a long struggle. Even defeat in the Battle of Britain failed to shake a remarkable mood of optimism. Hence, the force structure and organization with which the Wehrmacht embarked on "Barbarossa" was in no fashion suitable to the demands of a continental war. Conversely, the British and Americans drew certain lessons from the Battle of Britain that determined the course of the air war three years later. Overestimating the Luftwaffe's actual size, Anglo-American planners organized their nation's economic effort for an enormous increase in aircraft production. What is almost incomprehensible is the fact that the Germans paid so little attention to the attrition that had occurred in France and over Britain. Not until the Wehrmacht was deep in the Soviet Union did Göring finally authorize Milch to bring order to the aircraft industry. By that time, it was too late. British production programs had a two-year head start, while the American programs were at least a year ahead. If that handicap were not enough, Milch faced a constant, uphill battle to persuade the general staff to accept as a necessity the production increases that he proposed. That failure to gear German aircraft production to a worst case analysis of what Anglo-American industry might turn out cost the Luftwaffe the air war in 1943 and 1944. One cannot stress enough that administrative, strategic, and productive decisions in the 1940 to 1941 time frame insured the permanent inferiority of Germany's air effort throughout the remainder of the war. The basis of those decisions lay in an overestimation of the Reich's strength and a contemptuous arrogance that dismissed the Russians as subhumans and the Americans as capable of building only radios and refrigerators. Disdainful of their enemies and proud of their victories, the Germans were sure that their technological expertise and military competence could master any threat. In addition to production and mobilization issues is the question of attrition. There is an irony here, for airpower thinkers before the war, like the ground theorists, were sure that their doctrine would provide a means to return to the era of quick, cheap wars. According to them, aircraft would enable the nations equipped with air fleets to escape the killing of Paschendael, the Somme, and Verdun. The terrible reality was that war in the air was even deadlier for those who flew from 1939 to 1945 than the war in the trenches. 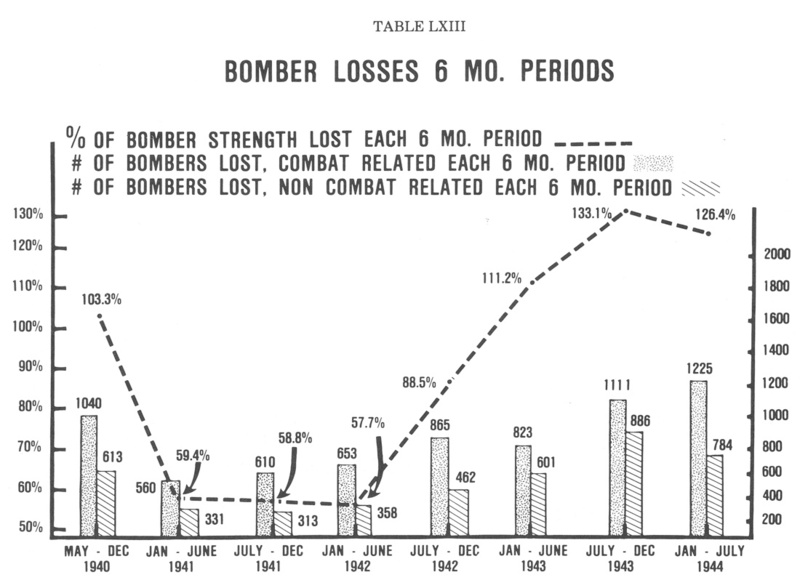 Martin Middlebrook in his book, The Nuremberg Raid, presents the survival prospects for aircrews who served in Bomber Command long enough to have a chance of completing a tour on operations (see Table LXI5). German pilots had no such thing as a tour on operations. For fighters, the attrition of German pilots over the war was probably well into the 90th percentile. The statistic mentioned in the last chapter on the average length of service of line pilots (between eight and thirty days) is an indication of the fate awaiting those who flew fighters for the Luftwaffe. The statistics for bomber, night fighter, or "Stuka" pilots could not have been much better. 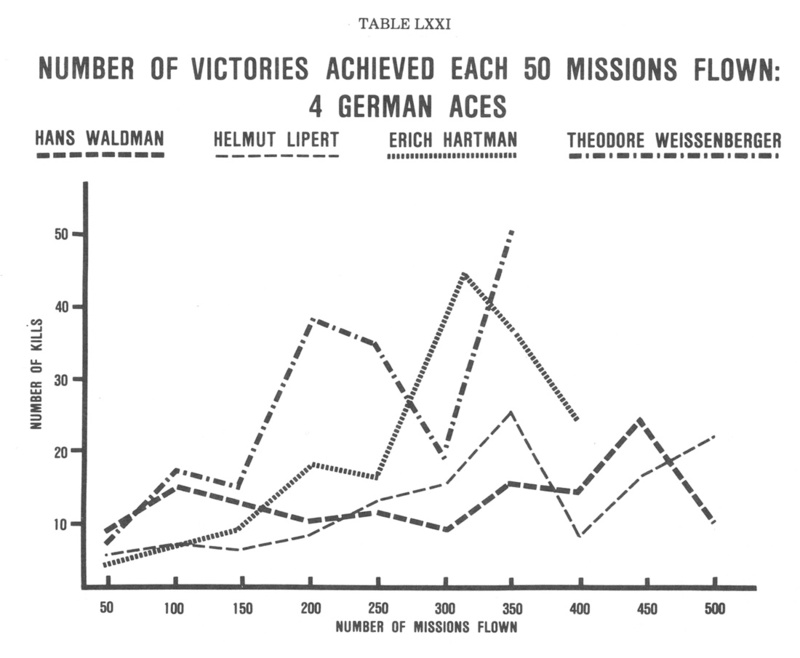 The statistics available on the Luftwaffe point out in unambiguous terms precisely how attrition affected its force structure and capabilities (see Tables LXII,6 LXIII,7 and LXIV8). 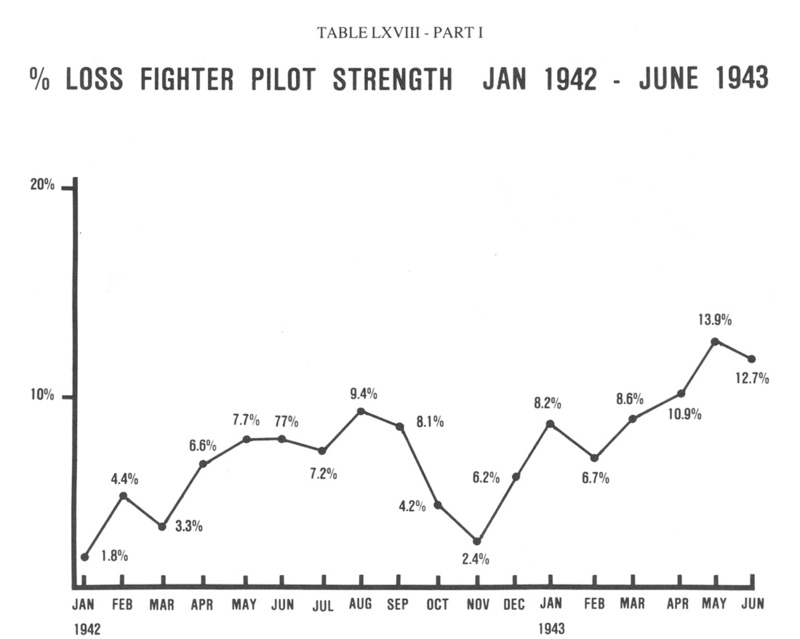 Through the first two years of the war (1940-41), the loss rates for aircraft had been alarming, even though the Germans had for the most part enjoyed qualitative superiority over their opponents. Thereafter, however, the impact of swelling enemy production and the commitment of the Wehrmacht to hold the distant perimeter of the expanded Reich steadily increased the attrition rate. 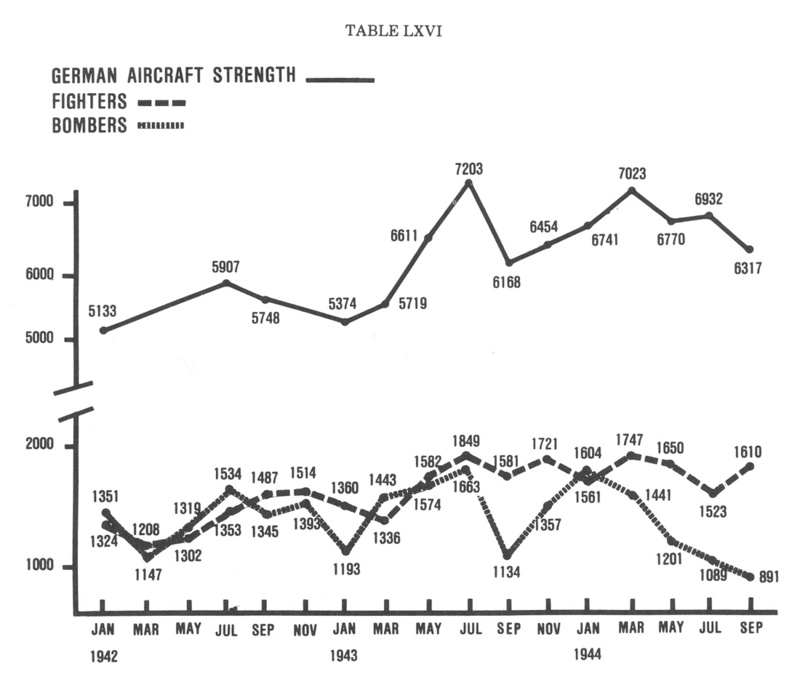 Increases in German aircraft production, no matter how impressive graphically, were ineffective since, in relation to Allied industrial efforts, the Germans were falling further and further behind. 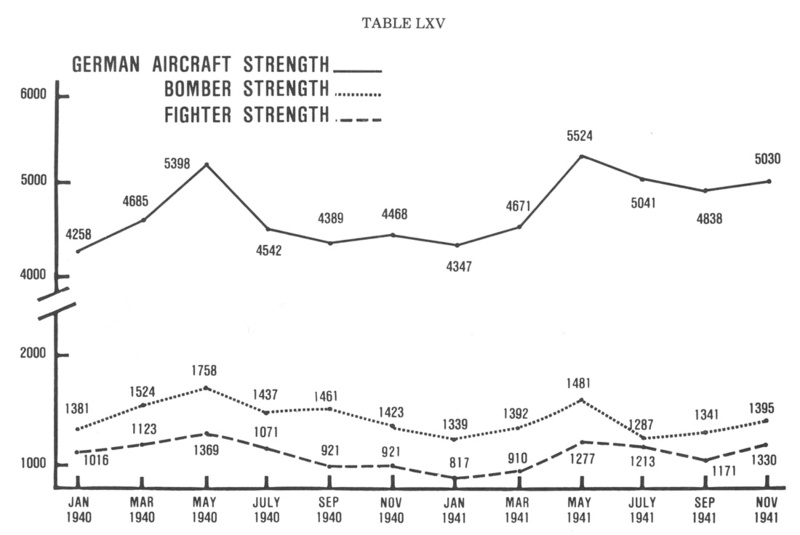 In fact, the impact of the air war on the German force structure was such that rising attrition cancelled out increasing production so that there was remarkably little change in the Luftwaffe's total frontline strength from 1940 through 1944, particularly in the combat categories of fighter and bomber aircraft (see Tables LXV9 and LXVI10). A comparison of the figures for May 1940 and January 1944 are most instructive; at the start of the French campaign, the Luftwaffe possessed 1,369 fighters and 1,758 bombers; over three and one-half years later, the Germans possessed only 1,561 fighters and 1,604 bombers (see Tables LXV and LXVI). In fact, the loss rate was such that increasing German production was never able to sustain frontline squadrons at their full authorized strength (see Table LXVII11). 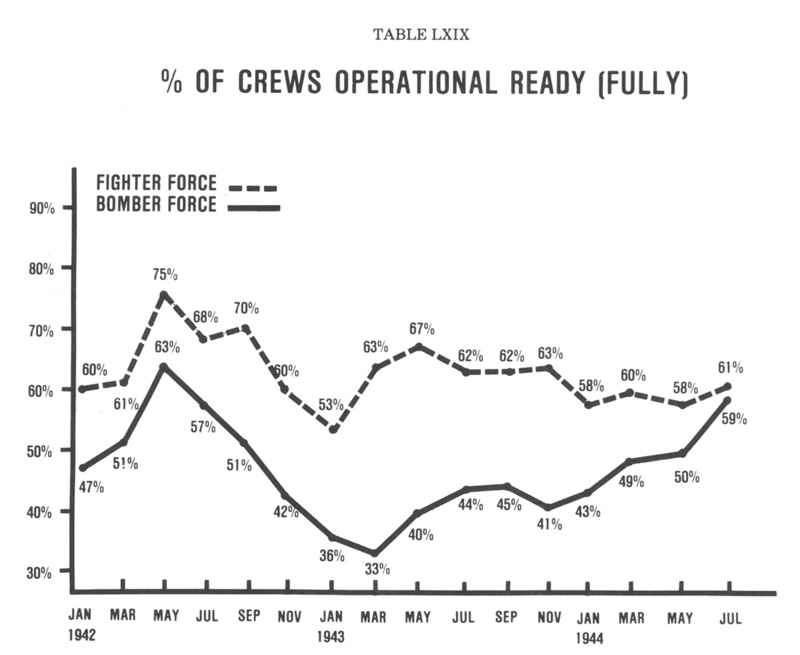 While there were, of course, fluctuations in the percentages of authorized strength on hand in frontline units, the trend from 1942 on was unmistakenly downwards. programs to fill empty combat cockpits. As a result, new pilots with less skill than their predecessors were lost at a faster rate. The increasing losses, in turn, forced the training establishments to produce pilots even more rapidly. Once they had begun this vicious cycle, the Germans found no escape. 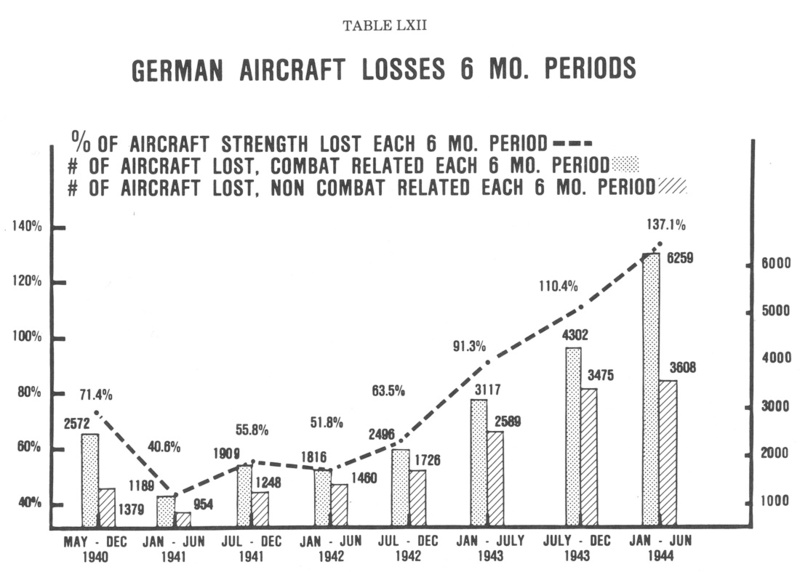 One of the surest indicators of the declining skill of German pilots after the 1940 air battles was the rising level of noncombat losses (see Tables LXII through LXIV). 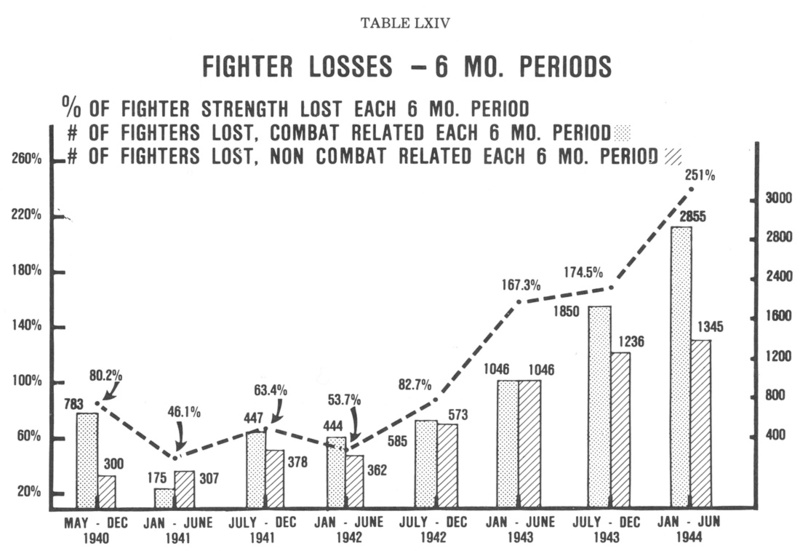 By the first half of 1943, they had reached the point where the fighter force suffered as many losses due to noncombat causes as it did to the efforts of its opponents. 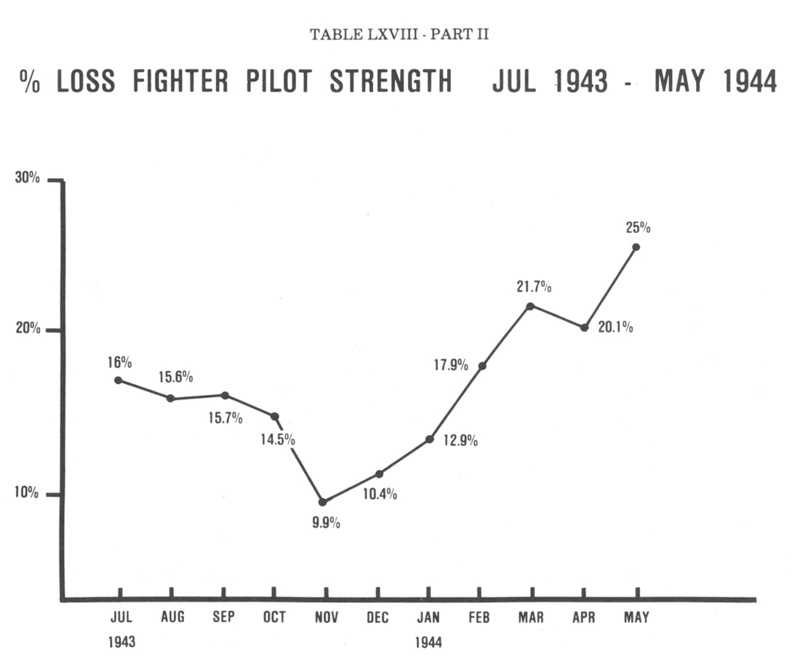 Thereafter, the percentage of noncombat losses began to drop. The probable cause of this was due less to an awakening on the part of the Luftwaffe to the need for better flying safety than to the probability that Allied flyers, in their overwhelming numbers, were shooting down German pilots before they could crash their aircraft. The Germans had embarked in the spring of 1940 on their campaign against Scandinavia, France, and the Low Countries. The military machine that made those conquests had been trained by some of the finest tactical and operational military minds in the history of warfare. Yet, even in the French campaign, a serious attrition of Germany's air and mechanized forces took place. For the next year and a quarter, the Wehrmacht went on a rampage that saw it conquer the Balkans, drive into Egypt, and win devastating victories in the Soviet Union. Nevertheless, despite the facade of glittering success, the ruthless, incontrovertible laws of attrition were at work. By the end of 1941, the Germans had lost the sharp edge on the ground as well as in the air. Having spent two years on the offensive, Hitler was unwilling to forgo the initiative, and German ground and air forces once again went over to the offensive in the summer of 1942. It is worth noting that several different types of attrition occurred during the war: "offensive," "reactive," and "imposed." In the summer of 1942, as in the previous two years, the attrition of aircraft and pilots resulted from offensive operations. Had the Germans not launched the major offensive in the east, little attrition of the Wehrmacht's strength would have taken place. Having established an equilibrium in the east in the spring of 1942 after the winter defeats, the Germans were in a position to fight on the strategic defensive. Had they done so, they could have substantially rebuilt and refitted both their ground and air forces. Their air strategy in 1941 and 1942 in the west suggested the possibilities involved in such a strategy. By pulling back from the Channel, the Luftwaffe fought at times and places of its choice. The inadequate range of British fighters and the inability of British bombers to exist in a hostile environment made it impossible for the RAF to tackle the Luftwaffe and its fighters except on German terms. Thus, while the British could attack coastal targets, they could not and did not win air superiority over western Europe. The Germans could contest French airspace when there was reason to do so. In the east in the summer of 1942, the Germans embarked on a strategy to break the back of the Soviet Union by conquering the Caucasus and large portions of southern Russia. The resources available for such wide-ranging aims were completely inadequate. To offset weakness on the ground, the German high command threw the Luftwaffe onto the scale. As a result, attrition of air units in support of offensive operations was extensive. These losses were avoidable in the sense that had the Germans chosen a more realistic strategy that was more consistent with their capabilities, they could have husbanded their strength for a confrontation with Anglo-American and Russian military power in the following years. They did not do so and, as had happened in 1941, the Luftwaffe found its frontline squadrons exhausted. This occurred despite Milch's substantive improvements in industrial methods and procedures, and a rapid increase in aircraft production over the low rates for 1940 and 1941.
periphery far from German sources of power. In the Mediterranean, the British at El Alemein and the Anglo-American effort against Algeria and Morocco attacked the entire Axis position in Africa. Unwilling to recognize how much the balance had swung against Germany, Hitler, supported by the OKW, responded to that challenge. The attrition that resulted was what one might term a "response" attrition. The Germans, reacting to moves in the Mediterranean, determined to stand and fight despite the disadvantage of vulnerable lines of communications from Sicily to Tunisia. At the same time, the Russians launched their counterattack at Stalingrad. Responding to a strategic move by his Soviet opponent, Hitler ordered Sixth Army to stand and fight along the Volga. Here again, the attrition was a "response" attrition, losses that the Germans could have avoided had they traded space for time. The resulting erosion in the Mediterranean and on the Russian front pushed the Luftwaffe's loss rates for the end of 1942 and the first half of 1943 towards a level of 20 percent per month. Meanwhile, a new danger appeared. In the west, British night raids had become an increasing threat to the safety of Germany's cities; and in the spring of 1943, the appearance of American daylight formations over the Reich represented a direct threat to the Luftwaffe and its sources of supply--the aircraft industry. Without new aircraft, the Luftwaffe could not meet its growing responsibilities and the increasing losses at the front. Unlike 1941 and 1942 when the Luftwaffe could fight on its own terms, it now had to meet the American bombers. The attrition that took place over the Reich, we might call "imposed" attrition, for Eighth Air Force forced the Luftwaffe to fight. However, as the Americans discovered, attrition is a two-way street. Even with the successes of American industrial and training programs, no organization can sustain a constant monthly attrition of 30 percent in manpower without consequences. The second raid on Schweinfurt produced so many aircraft and crew losses that Americans had to rethink their operational and tactical approach. the necessary fuel but there was no hope to train new pilots in the numbers needed to meet the daylight threat. The Luftwaffe attrition rate over the last three years of the war was extraordinarily high. Its impact on the German air force only began to become apparent in the summer of 1943 when it was arguably too late for the Germans to reverse trends that put them at an increasing disadvantage. There was some slight hope that a massive influx of resources might redress the balance between the fighter force and the enemy's growing air superiority. But even at this desperate moment, the Reich's leaders were unwilling to support such a program. The warning signs had been apparent earlier. The Americans especially had made no secret of their production plans. As the Germans fell behind in the production race, their losses mounted and attrition levels reached new highs, but they coped for a time. They coped until the gap between their production and Allied production reached such an extent that the Luftwaffe was effectively destroyed by numbers as well as quality. In the first years of the war, the Germans had confidently expected that their technological expertise and qualitative superiority would permit them to handle the numbers of aircraft that their Soviet and Western enemies produced. The rate of attrition was such that bit by bit the Germans lost their technological superiority. Moreover, the quickened pace of attrition forced the Germans to produce aircraft that were qualitatively inferior in a desperate attempt to keep up with the enemy's growing numerical advantage. On the pilot side, the wastage forced the Germans to settle for pilots whose training was manifestly inferior to those of Allied air forces. Even against the Russians, the qualitative difference between the pilots of the opposing sides narrowed after 1942; and by 1943, the Soviets also enjoyed overwhelming numerical superiority. In retrospect, it is difficult to understand how the Germans were able to get individuals to fly against such overwhelming odds. Several factors undoubtedly came into play. The most obvious is the fact that from the summer of 1943, German fighter pilots were desperately struggling to save their homeland from Allied bombing. In such circumstances and considering their ideological indoctrination, it is not surprising that German pilots continued to fly in the face of terrible odds. There are several other factors. The most important of these was the outstanding quality of middle-level leadership. The explanation for how squadron and flight commanders kept their organizations together lay in a rigid refusal by the Germans to lower the standards in the officers corps. "Better no officer than a bad officer" might be a characterization of how the Germans viewed recruiting for the officer corps. There was one additional element in the Germans' ability to continue the flight. Like the army, the Luftwaffe until almost the end prized unit cohesion. Units were not left in the frontline for interminable periods of time, with replacements arriving one or two at a time. Rather, when units had been badly shattered by heavy losses, they were pulled out of the line to be physically rebuilt with new crews and new aircraft. The Germans were thus able to renew the bonds between those who would fly and fight together and who would depend on each other for survival. The failure of the Luftwaffe was symbolic of the fate of the Third Reich. Germany's leaders held goals that were manifestly beyond the nation's capabilities. The devastating nature of their success in the first years of the war should not disguise the dilettantism among those who conducted the Reich's grand strategy. Thus, intermixed with an exceedingly high level of competence on the tactical and operational side was a complete inability to see a relationship between means and ends on the level of grand strategy. With the exception of the foundering that occurred between the fall of France and the onset of "Barbarossa," one can doubt whether Hitler ever had a grand strategy. Defeat in Russia led to the swift removal of those who might have raised questions about Germany's strategy; and the Germans, led by a Führer who based his approach to war on intuition, went to their inevitable doom. To the end, they waged that struggle with operational and tactical competence, but the tenacity of their defense only insured that their final defeat would be all the more terrible. 1. Verrier, The Bomber Offensive, p. 327. 2. The following discussion is based on a very interesting section of a major work on the establishment of the Hitler myth in Germany. The author has based his study on the SD reports on attitudes in the population; and as those reports were widely read in the upper levels of the Nazi Government, certain aspects of German strategy on the last war years now become clear: Ian Kershaw, Volksmeinung und Propaganda im Dritten Reich (Stuttgart, 1980), pp. 176-86. 3. USSBS, "V-Weapons (Crossbow) Campaign," Military Analysis Division, Report #60, January 1947. 4. See particularly: "Heimatverteidigungsprogramm 1943, Besprechung beim Reichsmarschall am 7.10.43.," AFSHRC, K 113.312-2, v. 3. 5. Middlebrook, The Nuremberg Raid, p. 275. 6. BA/MA, RL 2 III/1025, "Front-Flugzeug-Verluste," Genst. 6. Abt. (III A), May 1940-Jun 1944. 9. 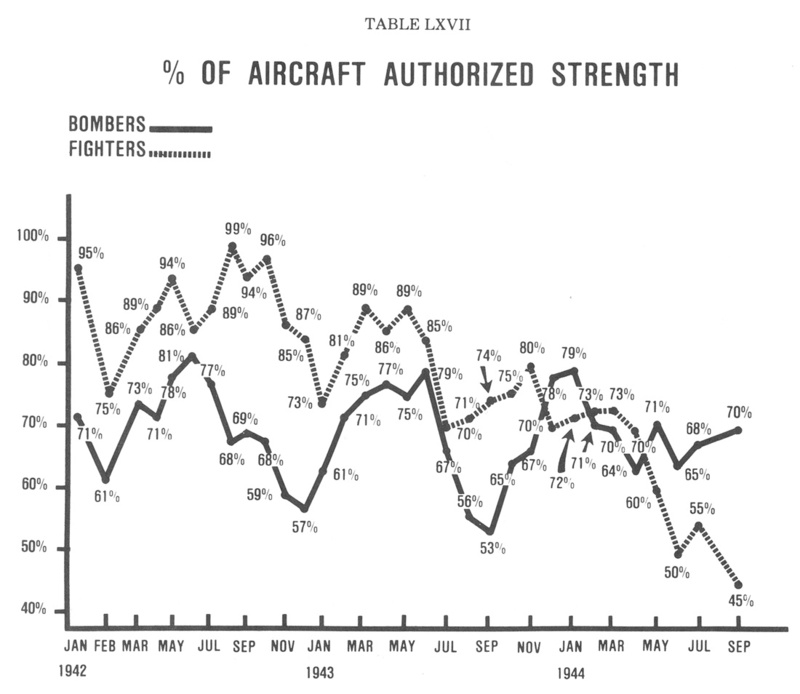 "Luftwaffe Strength and Serviceability Tables, August 1938-April 1945," Air Historical Branch, Translation No. VII/107. 11. BA/MA, RL 2 III/717-732, "Übersicht über Soll, Istbestand, Einsatzbereitschaft, Verluste und Reserven der fliegenden Verbände," 1942-1944. 13. BA/MA, RL 2 III/717-732, "Übersicht über Soll, Istbestand, Einsatzbereitschaft, Verluste und Reserven der fliegenden Verbände," 1942-1944. 14. Martin Gilbert, Winston Churchill, Vol. V, 1922-1939 (London, 1976), p. 927. 15. USSBS, "Overall Report (European War)," September 30, 1945, p. 21. 16. I am indebted to Benjamin Rand of Yale University for the information on which this table is based. 17. Ernest Obermaier, Die Ritterkreuzträger der Luftwaffe, Vol. I (Mainz, 1970), p. 21. I am indebted to Benjamin Rand of Yale University for pointing this out to me.